Whenever a poll has been conducted to name the best actress ever in Tamil and Telugu cinema, one name has always garnered the most votes and that too by a huge margin – Savithri. 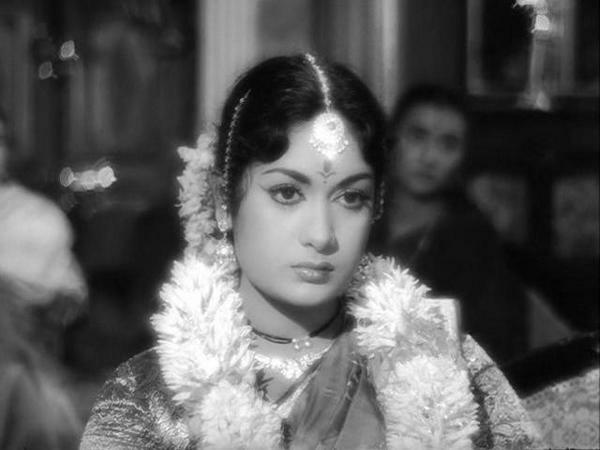 Savithri was a tremendous actress, leading her to be titled ‘Nadigeyar Thilakam’ (Great Actress) and was known outside Tamil and Telugu filmland as ‘Meena Kumari of the South.’ Both actresses were known for their intense tragic roles, both had highly troubled marriages, both suffered from alcoholism and both died young. Meena Kumari was 39, while Savithri was in her forties. Savithri Kommareddy was born into a wealthy family in Chirravuru, Guntur District, Andhra Pradesh. However, there is no clear indication of her exact date of birth. A website dedicated to the actress states it to be December 6, 1935 (Wiki agrees with the day but pegs the year as 1933), while a 1956 issue of Screen’s Who’s Who Year Book states it to be January 11, 1937. Savithri learnt music and dance under Sista Purnayya Sastry and gave some public performances as a child in Vijaywada. She then made her debut in films with LV Prasad’s Telugu film, Samsaram (1950). A few minor roles followed till she broke through and became a star with Pelli Chesi Choodu (Telugu)/Kalyanam Panni Paar (Tamil) (1952). The bi-lingual film, directed by Prasad, was an ensemble comedy abounding in intrigues and disguises geared to the making and breaking of marriage alliances. Savithri’s next major role was in Devadasu (Telugu)/ Devadas (Tamil) in 1953, playing Paro to A Nageshwara Rao’s Devadas, perhaps his most iconic role. This was the second Tamil version and first Telugu version of the Sarathchandra novel. The film was shot mostly in Madras and the songs, composed in both languages, by CR Subburaman were extremely popular as were the tragic performances of Savithri and A Nageshwara Rao. Savithri established her great acting credentials with Ardhangi (Telugu)/Pennin Perumai (Tamil) (1955). She gave an excemptionally strong performance as a woman, forced to marry a mentally retarded man (A Nageshwara Rao (Telugu)/Gemini Ganesan (Tamil)). She nurses the man back to health while teaching a lesson to her scheming mother-in-law and brother-in-law (K Jaggiah (Telugu)/ Sivaji Ganesan (Tamil)). The film was re-made in Hindi as Bahurani (1963) starring Guru Dutt, Mala Sinha and Feroz Khan and again as Jyoti (1981) starring Hema Malini and Jeetendra, but it is Savithri’s performance that remains the most appreciated. The same year, 1955, also saw one of Savithri’s most famous and popular films – the bilingualMissamma (Telugu)/Missiamma (Tamil). The film, directed by LV Prasad, was a hit comedy about a couple pretending to be married in order to get a job to run a school as the job advertises for a married couple only. The Tamil version in particular launched the Gemini Ganesan-Savithri pair (NT Rama Rao played the lead in the Telugu version opposite Savithri). One song especially popular in the Tamil version was the Ghantasala-P Susheela duetVaraya Vennilave. Though she would go on to be known as a tragedy queen par excellence, Savithri proved to be equally adept at comedy with a fine sense of timing as Missmama/Missiamma showed. Incidentally, Prasad went on to do a Hindi re-make of the film, Miss Mary (1957), with Meena Kumari in the Savithri role! The mid 1950s to mid 1960s was Savithri’s peak as an actress as she gave a string of memorable performances in both Telugu and Tamil films in a wide variety of roles. She proved to be an extremely versatile actress with no role beyond her, even if most of these roles capitalised on her immense talent as a tragedienne. She acted mostly opposite stalwarts Sivaji Ganesan, Gemini Ganesh and A Nageshwara Rao in these films and considering the number of films she did with them, it is strange that she did just three films with MGR. Some important films of Savithri in this period were Kalathur Kannamma (1960), Kappalotiya Thamizhan (1961), Pasamalar (1961), Pavammannipu (1961), Raktha Tilakam (1963) and Kandan Karunai (1967) in Tamil and Aradhana (1962), Moogamanasalu (1963), Varakatnam (1968) and Maro Prapancham (1970)in Telugu. Of these, special mention must be made of Pasamalar and Pavamanippu and the Telugu-Tamil biliingual Pandava Vanavasam (1965). Pasamalar, directed by A Bhimsingh, is a brother and sister story about the orphaned Rajasekharan (Sivaji Ganesan) and his sister, Radha (Savithri). Radha marries Anand (Gemini Ganesan), her brother’s colleague. Rajasekharan goes blind and tries to find his sister. Eventually the two die in each other’s arms. The film was extrmely popular due to the wonderful performances of Sivaji and Savithri and the TM Soundararajan song, Malarinthum Malarathawherein Sivaji dreams of his sister’s marriage and what he will do for her child. Such was Savithri’s dedication that to reduce her weight for the latter part of the film, she actually underwent partial fasting for a month. Pavamanippu, also directed by A Bhimsingh, was a tale about communal harmony helped by strong performances by Sivaji, Savithri and in particular MR Radha. A highlight of the film was the song written by Kannadasan, then of the DMK, lampooning religion – Vandhanal Mudhal Indhanaal Varai. The song, sung by TM Soundararajan and GK Venkatesh, castigates man’s tendency to separate nature into categories. The film, needless to say, was a huge success. Pandava Vanavasam, directed by Kameshwara Rao, sees Savithri in perhaps her most famous mythological film, playing Draupadi, one of her most well-known and remembered roles. The film has NT Rama Rao playing Bhima, Ranga Rao playing Duryodhana and some brilliant music by Ghantasala Venkateshwara Rao. Savithri had got romantically involved with Gemini Ganesan and this led to a secret marriage in 1956. Savithri first revealed the marriage to the public when she began signing her photos as ‘Savithri Ganesh.’ The marriage, produced two children, Vijaya Chamundeswari and Sathish. But down the years, as the marriage broke up (it is said Ganesan left her), it destroyed Savithri. She took to drugs and alcohol in a big way and died on December 26, 1981. Among Savithri’s last films of note in the 1970s was Jagan Mohini (1978), a ghost film, that proved to be a big hit in a year marked by some spectacular flops in Telugu. Her last film was released posthumously in 1985, Andarikante Monagadu. Besides acting, Savithri also produced and directed some films in the period from 1968 – 1971 but without much commercial success. Films directed by Savithri include Chinnari Papalu (1968), Chiranjeevi (1969), Mathrudevata (1969), Kuzhandai Ullam (1969), Samsaram (1971)and Praptham (1971).